The National Park Service Partnership Wild and Scenic Rivers Program is dedicated to protecting nationally significant river resources through locally based partnerships. Legislation sponsored by former U.S. Congresswoman Niki Tsongas was signed into law on December 19, 2014 which authorized the Nashua River Wild and Scenic Rivers Study Committee. 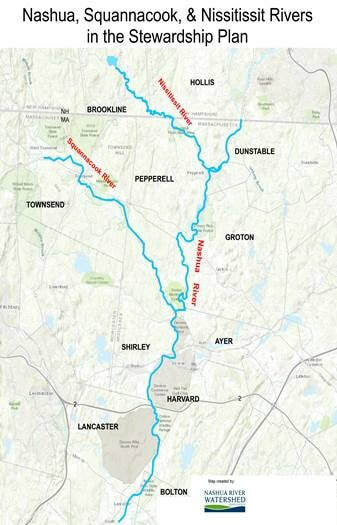 The Nashua, Squannacook, and Nissitissit Rivers are an essential part of our region’s culture, character, and history. They are also an essential part of our future. Nine communities in Massachusetts and two communities in New Hampshire along the Nashua, Squannacook, and Nissitissit Rivers have worked together on a planning process with local groups and state & federal agencies. Our mission is to craft a vision for the future of these rivers, to consider their eligibility and suitability to be part of the National Wild & Scenic River System, and to determine how these rivers should best be managed in order to protect water quality and outstanding values such as biological diversity, recreation, and cultural & historical resources. Having completed a three-year planning process, and with all eleven participating communities having voted affirmatively, former Congresswoman Tsongas introduced a bill to Congress in Fall 2014 to designate sections of the rivers as Partnership Wild and Scenic Rivers. The process to date has resulted in the formation of strong local partnerships and has built public awareness, appreciation of these rivers, and support for the voluntary, locally based stewardship plan that was developed as part of the study. The goal is to protect our shared outstandingly remarkable resources for the future as well as attract public and private funding to enhance public enjoyment of these rivers.